Bonne Marie was mentioned in an article Thursday in The New York Times about knitting and the Internet (I think you'll be able to get there even if you're not registered with the Times, but I'm not sure). The same article ran today in the Chicago Tribune's Business section (my husband discovered it in the hard copy; I haven't checked if it is also online). How great is that! Jenna of GirlfromAuntie and her Rogue pattern get significant ink because the writer was involved in the Rogue-along. I do love that pattern -- I definitely have to get me a copy. These little films are sweet, dark, and funny all at once. I laughed out loud at each one. The New York Times had a story on them this morning. I hope my version of Gigi turns out half as well as Action Hero Melissa's did! The crocheted flower is such a cute touch. Happy Memorial Day weekend to all! Can you believe it's the end of May? Sleeve No. 1 for Gigi is growing. I'll have more time for knitting soon; I meet with my students once more this week, twice next week, and give them a final the following week. Yippee!! My hat is off to teachers, students, and alumni of schools on the semester system...I don't know how you do/did it. I can't imagine being involved in something like this for 15 weeks -- I'd only be 2/3 through at this point?!? Unthinkable. ...means Mary doesn't have a whole lot of knitting progress to report. But I can always find time to daydream: A little shop down the street has two knit ponchos in the window. They appear to be handknit, but they're hanging up on display and I couldn't see the inside label. I saw the pricetags, however -- $160! I wouldn't have bought one anyway, but they did provoke a serious case of poncholonging. I really want to have one for the summer, for when the nights turn chilly and I could use something more stylin' than a college sweatshirt. I've made some good progress on Fleuressence, my Linen Drape-along project. The KIP on Thursday night drew record-breaking crowds! I worked on Fleuressence almost the whole time, though I did take a break to cast on the first sleeve for Gigi. I also worked on Fleur last night during "Troy," which Clark and I enjoyed. I am generally neutral about Brad Pitt, but he did a fairly nice job here, I thought. Peter O'Toole was great. I was reminded, however, that one basically wants to throttle all of the main characters in "The Iliad" except Hector. Fun fact: I knit faster during the battle scenes. Talk about tension! Here's a photo. 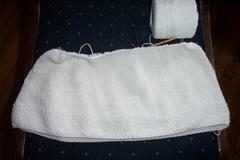 I've done a couple of increase rounds, so there are three or so of those babies to go before the armholes. I really do love this yarn. I hope I'll like the design of the finished top. 'Course, I'll have no one to blame but myself if I don't! Well, now, how did I get off on that tangent? As my friend Vic would tease, "What in the whorld?" Tomorrow night -- you're invited! Thanks to Bonne Marie for the graphic and instructions on how to use it! All I've accomplished knitting-wise lately are a few rows on my Linen Drape-along top -- it doesn't look much different from the earlier photo, so I'll wait till it grows a bit more. I should come up with a name for it...hmmm....White Linen Drape, a hybrid of Essence and Flourish, with other inspiration(s) to be determined game-time...how about Fleuressence? This morning I picked up the second sleeve of the Linen Drape cardigan (not my -along project; an older WIP) for the first time in ages. I just need to do a couple more rows to get to the cap, which should then go pretty quickly. It sure would be nice to wear this garment! What a concept. DePaul University, where I'm teaching this quarter, recently named a new president. He's giving some brief remarks at a reception this afternoon. I suppose it will be crowded, but at least I'll have an idea of what he looks like. While he's speaking, of course, I'll be mentally revising Chapter 2 of my dissertation, which is really what I should be doing this afternoon (and every afternoon...morning...evening...overnight) until I finish it. I've been scrambling like a madwoman this past week; I think I have knit about three rows in the last five days. Boo! I even missed wishing all and sundry a happy Mother's Day -- please accept my late but very admiring and happy tidings if you're a mom. Things are going to ease up here soon. Hope all's well in your world!